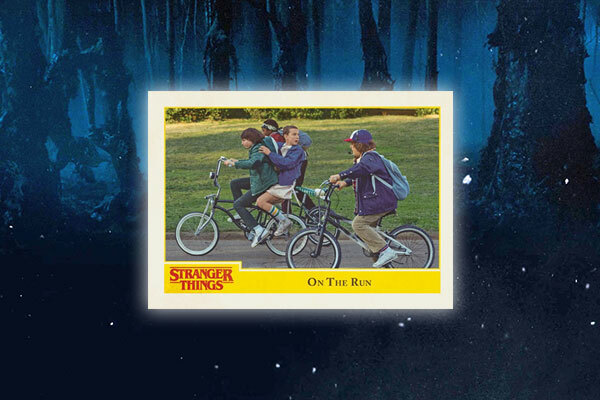 Jump to the 2018 Topps Stranger Things checklist. 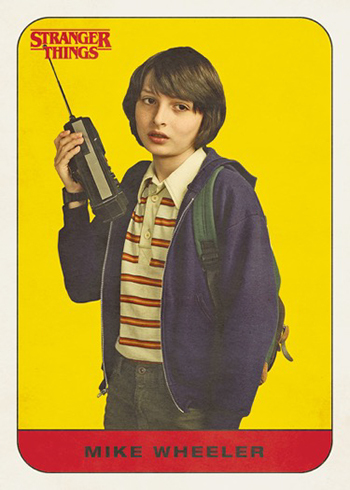 But it’s not totally retro. 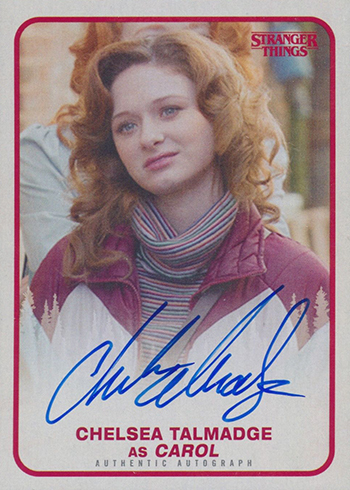 Modern elements like autographs and other chase cards are available as well. 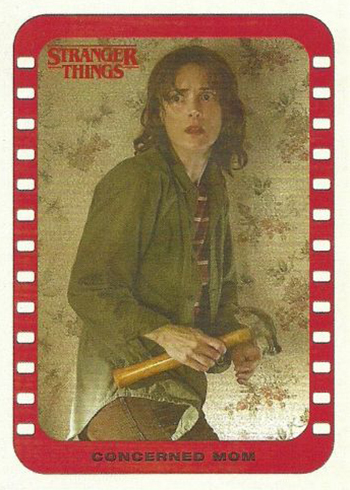 In the ’80s, all collectors usually had were the base cards, a sticker and a stick of gum. The gum’s gone but the main set remains (along with the stickers). 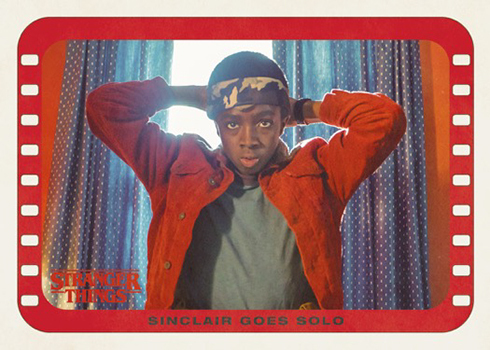 Season one is summarized over the course of 100 cards. All are done on retro card stock like what’s used in modern Topps Heritage releases. 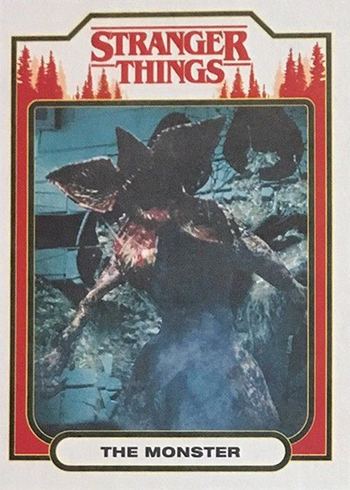 On the entertainment trading card side, Topps used this kind of stock in Star Wars: Journey to The Last Jedi. Another modern element is the inclusion of parallels, rarer versions of the main set. These take a thematic approach with Upside Down (/99), Waffle (/11) and Christmas Light (1/1). Printing Plate versions are also available in Black, Cyan, Magenta and Yellow. All are one-of-ones. Sticking with the retro theme are two different sets of stickers. Twenty Character Stickers show the season’s stars. 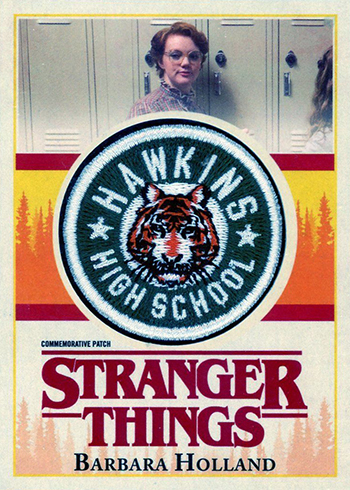 There are also separate ten Stranger Things Stickers that have a film strip design similar various non-sport sets have had in the past like Star Wars. 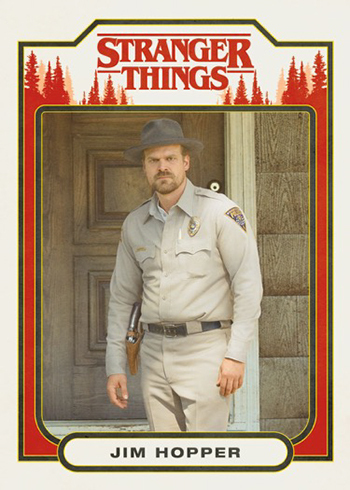 There’s also a 20-card Characters insert set done as regular cards. Autographs lead the premium insert chase. Besides the regular versions, these have Orange (/99), Green (/50), Purple (/25), Blue (/10) and Gold (1/1) parallels. 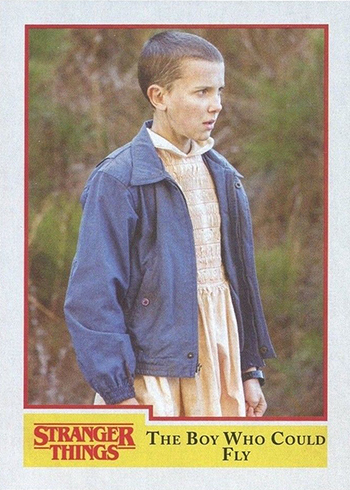 Of the regular autographs that are in packs and not redemptions, all are on-card except Millie Bobby Brown. Her signatures come on a sticker. Dual and Triple Autographs are rare with just ten copies each. These come with multiple signatures. 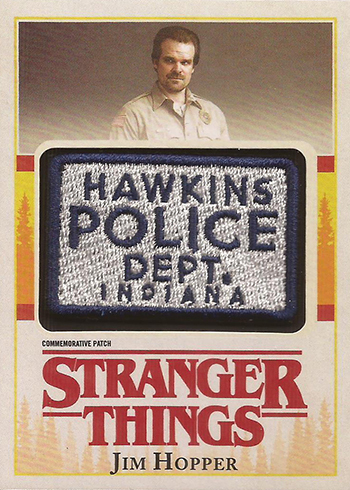 Commemorative Patch Cards have a manufactured patch embedded in them. These have the same levels of parallels as regular autographs. There are also signature versions numbered to 10. 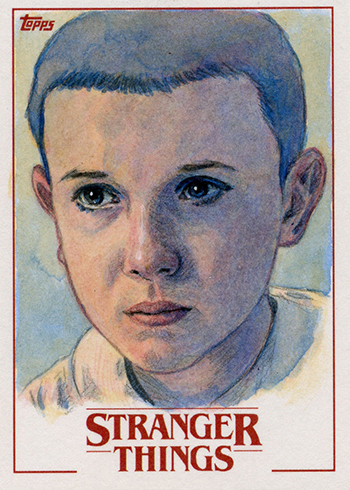 Sketch cards come with original art done directly on the card. Given the unique nature of each piece, many regard these as one-of-ones. 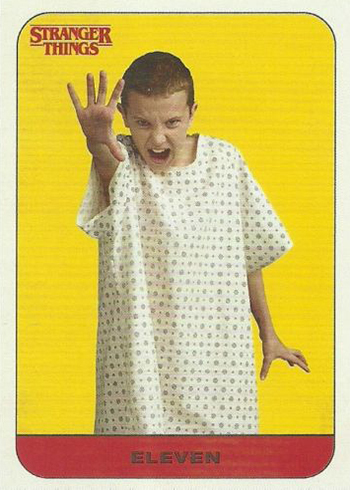 These aren’t actually the first official Stranger Things trading cards. 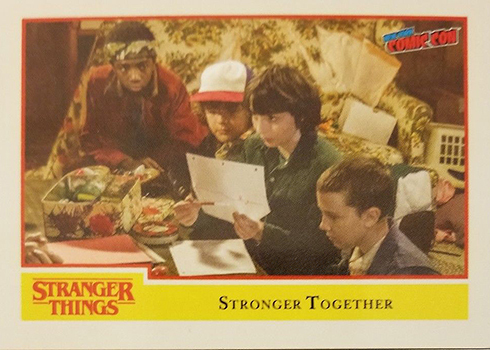 Among the swag in a special Stranger Things LootCrate was an old-school style wax pack with a small set of 11 cards and two stickers covering seasons one and two. 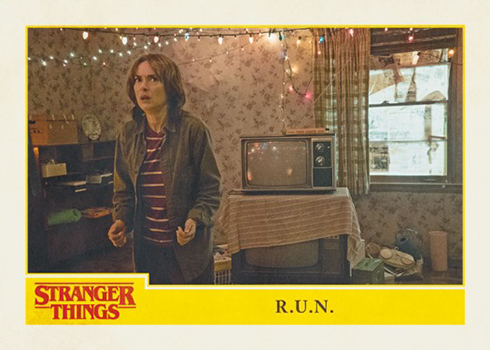 In addition to hobby boxes, 2018 Topps Stranger Things has retail packs and blasters. 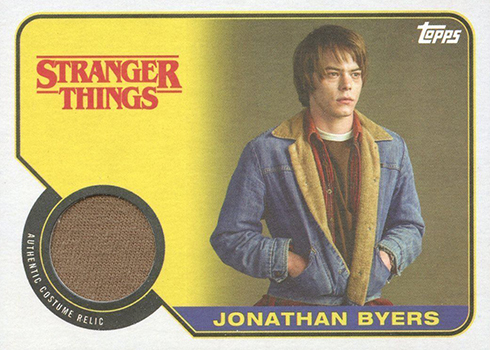 It’s worth noting that retail packs do not have autographs. 50 Should I Stay or Should I Go? A-TH Chester Rushing as Tommy H.
Hobby 1:49, Retail 1:29, 1 per Blaster Box. The parallel sets are next to impossible to complete. The odds of getting one Christmas lights parallel is over 1 in 6000 packs.